The acronym UDF stands for User Defined Function. With the UDF, you can create a custom function (i.e. not a part of excel built-in functions). It comes in very handy when it requires nesting of multiple built-in excel functions. Can we record a UDF? No, you cannot record a UDF. 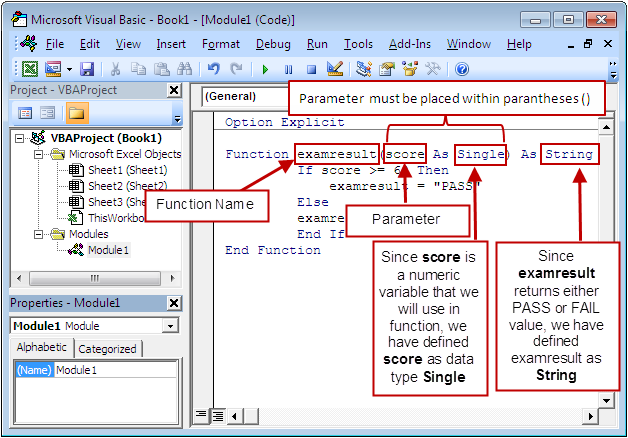 You have to write code for UDF yourself in module area of visual basic editor (VBE). It comes in very handy when it requires nesting of multiple built-in excel functions. By creating a UDF one time, you can use it anywhere in the workbook. It will do what you want. You can use a UDF in the Sub procedure. UDFs must begin with Function keyword, followed by function name and then define parameter with in parentheses (), followed by As keyword and functions's data type and end funtion with End Function. Important Point : If you have no parameter, you still need to write parentheses (). Suppose you are asked to write a custom function that converts Fahrenheit to Celsius. Like the other excel built-in functions, enter your custom function with = followed by function name. In this example, 100 is the Fahrenheit value. 1 Response to "Excel VBA : User Defined Functions (UDFs)"